West Africa’s Ebola outbreak, which has been disrupting agricultural and market activities, threatens to erode food security and negatively affect the livelihoods of millions of already vulnerable people in Guinea, Liberia and Sierra Leone unless more is done to meet their immediate food and nutritional needs, say aid agencies. They say they are still calculating the number of food insecure households, but already the results of initial rapid assessments are worrying. The World Food Programme (WFP) found that more than 80 percent of people surveyed via mobile phone in the eastern part of Sierra Leone say they have been eating less expensive food since the outbreak began. Three-quarters of respondents have begun to reduce the number of daily meals and portion sizes. A rapid assessment survey last month in Sierra Leone by the Food and Agriculture Organization (FAO) found that 47 percent of farmers have had their work “considerably disrupted” by the Ebola outbreak. “Here, we have the largest cocoa farms,” said Sidikie Kabba, a farmer from eastern Sierra Leone. “Now it’s quarantined because of Ebola, so people aren’t travelling. Before, I was harvesting my produce – up to 50 bags – but now even 10 bags is difficult. So I’m losing money,” he said. While Kabba stayed behind, many farmers stopped going to their fields during the most critical stage of the agricultural cycle – in July and August this year – when there was widespread misunderstanding of the disease. In Sierra Leone’s Kailahun District in the east, at least 40 percent of farmers abandoned their land to move to non-affected areas according to the Minisrty of Agriculture. Many seasonal migrant workers, who normally help with harvesting have been either too afraid to work alongside others in the fields or unable to travel due to quarantine restrictions. In Liberia, rice production decreased by 10 percent in Lofa County this year because of fear among farmers, according to the Food and Agriculture Organization (FAO). In Barkedu and Foya counties, rice production fell by 15 percent. The results of a four-week joint assessment on the impact of Ebola on food security, livestock and agriculture in Guinea, which is now under way by the Ministry of Agriculture, FAO and WFP, will not be available until mid-November, but Gueckedou’s Prefectural Directorate for Agriculture says that the total land area that was cultivated this year has “considerably declined” compared to past years. 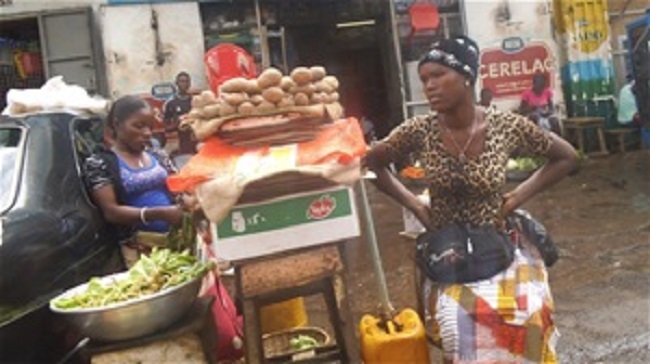 Closed markets and disruptions in trade, transportation and people’s movements, have also led to food shortages in many communities across Liberia, Guinea and Sierra Leone, particularly those in border areas. “Right now we are having a hard time getting regular supplies from farmers and other suppliers,” said Adama Conteh, who sells rice and vegetables in Freetown’s Bombay Terrace. Most of the areas we normally buy from are very hard to go to now because of this Ebola. Many of the farmers are afraid to go to their farms and harvest, or even come to Freetown with their products,” she said. Along the border of Guinea and Senegal, at least 16 weekly markets have been shut down, according to WFP. In Liberia, many of the weekly markets also remain officially closed. In places where food is still available, some prices are going up. In Liberia’s Lofa County, for example, the country’s former epicenter of the outbreak, food and commodity prices rose between 30 and 75 percent between April and September, according to FAO. Certain types of fish are now five times more expensive than before the outbreak began. In Sierra Leone, the price of imported rice increased by upwards of 15 percent in some areas, according to the Famine Early Warning Systems Network (FEWS NET). This is compounded by the fact that household incomes and savings are decreasing, as people are either unable, or too afraid, to work. And as more and more people contract the virus or die from it, families are also losing key sources of revenue. To help ease some of these impacts and reduce the risk of rising food insecurity, FAO says it plans to support 90,000 households across the most affected Ebola communities over the coming year. Through a combination of activities related to saving lives and protecting livelihoods, FAO plans to work with its partners to raise community awareness about Ebola, train health workers, build up local health systems to be better prepared for disease threats and improve response coordination efforts, while increasing agricultural production, boosting incomes through cash transfer schemes and supporting microfinance initiatives. “We have to be aware of the situation and we have to react quickly so that we don’t have, in addition to this health problem, a major food security crisis,” Martin said. In Liberia, where women have been particularly hard hit by market disruptions, as they account for an estimated 70 percent of cross-border trade, FAO plans to give an estimated 2,500 families from local women’s associations cash transfers in exchange for helping spread Ebola awareness messages in their communities. They will also be given vegetable seeds to grow during the dry season, to help bring in some extra income. WFP says it has already delivered more than 9.1 million tons of food to 534,000 people in Sierra Leone, Liberia and Guinea since April. They plan to reach a total of nearly 1.4 million people by the end of February. This might not, however, be enough. Based on the Centers for Disease Control and Prevention’s (CDC) current caseload projection of 200,000-250,000 Ebola cases by early 2015, FEWS NET says that between 2.7 and 4 million people could reach at least a Phase 3, or crisis level, of food insecurity by March. Hillbruner said that while the priority should still be to focus all efforts on the prevention, treatment and containment of the Ebola outbreak, the best way to prevent a large-scale food crisis is to have a contingency plan in place.